(Nanowerk Spotlight) The potential benefits of Nanofoods – foods produced using nanotechnology – are astonishing. Advocates of the technology promise improved food processing, packaging and safety; enhanced flavor and nutrition; ‘functional foods’ where everyday foods carry medicines and supplements, and increased production and cost-effectiveness. In a world where thousands of people starve each day, increased production alone is enough to warrant worldwide support. For the past few years, the food industry has been investing millions of dollars in nanotechnology research and development. Some of the world’s largest food manufacturers, including Nestle, Altria, H.J. Heinz and Unilever, are blazing the trail, while hundreds of smaller companies follow their lead. Yet, despite the potential benefits, compared with other nanotechnology arenas, nanofoods don't get a lot of publicity. The ongoing debate over nanofood safety and regulations has slowed the introduction of nanofood products, but research and development continue to thrive - though, interestingly, most of the larger companies are keeping their activities quiet (when you search for the term 'nano' or nanotechnology' on the websites of Kraft, Nestle, Heinz and Altria you get exactly zero results). Although the risks associated with nanotechnology in other areas, such as cosmetics and medicine, are equally blurry, it seems the difference is that the public is far less apt to jump on the nanotechnology bandwagon when it comes to their food supply. 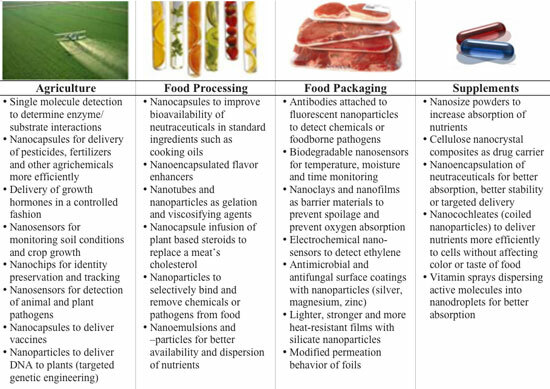 According to a definition in a recent report ("Nanotechnology in Agriculture and Food") food is “nanofood” when nanoparticles, nanotechnology techniques or tools are used during cultivation, production, processing, or packaging of the food. It does not mean atomically modified food or food produced by nanomachines. In the forefront of nanofood development is Kraft Foods, which took the industry’s lead when it established the Nanotek Consortium, a collaboration of 15 universities and national research labs, in 2000. Kraft’s focus is on "interactive" foods and beverages. These products will be customized to fit the tastes and needs of consumers at an individual level. Possible products include drinks that change colors and flavors to foods that can recognize and adjust to a consumer's allergies or nutritional needs. Other large companies, such as Nestlé and Unilever, are exploring improved emulsifiers that will make food texture more uniform. These huge Western companies are responsible for the bulk of the food industry’s research and development, however the nanofood industry is truly a global phenomenon. In Australia for instance, nanocapsules are used to add Omega-3 fatty acids to one of the country’s most popular brands of white bread. According to the manufacturer, nanocapsules of tuna fish oil added to Tip Top Bread provide valuable nutrients, while the encapsulation prevents the bread from tasting fishy. NutraLease, a start-up company of the Hebrew University of Jerusalem has developed novel carriers for nutraceuticals in food systems. The nano-sized self-assembled structured liquids (NSSL) technology allows for encapsulation of nutraceuticals, cosmeceuticals, and essential oils and drugs in food, pharmaceuticals, and cosmetics. Another advantage to the NSSL technology is that it allows the addition of insoluble compounds into food and cosmetics. One of the first products developed with this technology – a healthier version of canola oil – is already available to consumers in Israel. In other parts of the world, nanotechnology efforts are focused on the agricultural side of food production. A joint effort among universities in India and Mexico is directed at developing non-toxic nanoscale herbicides. Researchers at Tamil Nadu Agricultural University in India and Monterrey Tech in Mexico are looking for ways to attack a weed’s seed coating and prevent it from germinating. The range of current nanofood research and development is as impressive as the industry’s projected growth. Last August, UK-based Cientifica estimated that nanotechnologies in the food industry were currently valued at $410 million and would grow to $5.8 billion by 2012. Novel food packaging technology is by far the most promising benefit of nanotechnology in the food industry in the near future. Companies are already producing packaging materials based on nanotechnology that are extending the life of food and drinks and improving food safety. While the nanofood industry struggles with public concerns over safety, the food packaging industry is moving full-speed ahead with nanotechnology products. Leading the way is active or “smart” packaging that promises to improve food safety and quality and optimizes product shelf-life (for example, see a recent Nanowerk News article "Intelligent food wrappers with nanotechnology"). Numerous companies and universities are developing packaging that would be able to alert if the packaged food becomes contaminated; respond to a change in environmental conditions; and self-repair holes and tears. One of the most promising innovations in smart packaging is the use of nanotechnology to develop antimicrobial packaging. Scientists at big name companies including Kraft, Bayer and Kodak, as well as numerous universities and smaller companies, are developing a range of smart packaging materials that will absorb oxygen, detect food pathogens, and alert consumers to spoiled food. These smart packages, which will be able to detect public health pathogens such as salmonella and e. coli, are expected to be available within the next few years. Similar technology is being developed for the U.S. Government as a means of detecting possible terrorist attacks on the U.S. food supply. Scientists in the Netherlands are taking smart packaging a step further with nanopackaging that will not only be able to sense when food is beginning to spoil, but will release a preservative to extend the life of that food. Because of their ability to improve safety and extend the life of food, these nanopackaging solutions are some of the most exciting innovations in the food industry today. However, other less dramatic (but far more practical) developments in nanopackaging are already in use around the world. Clay nanocomposites are being used in plastic bottles to extend the shelf life of beer and make plastic bottles nearly shatter proof. Embedded nanocrystals in plastic create a molecular barrier that helps prevent the escape of oxygen. The technology currently keeps beer fresh for six-months, but developers at several companies are already working on a bottle that will extend shelf life to 18 months. Several large beer makers, including South Korea’s Hite Brewery and Miller Brewing Company, are already using the technology. Because there is little government oversight in this area, says Craig Minowa, an environmental scientist for the Organic Consumers Association (OCA), the public may have little to say about it. "Products are not labeled, so consumers cannot choose to avoid them," he explains. The OCA, a grassroots non-profit public interest organization based in the U.S., is one of many vocal organizations calling for government regulation on nanofoods, at least until more safety testing is completed. These organizations argue that a lack of evidence of harm is not the same as reasonable certainty of safety, which is what food companies must demonstrate to the U.S. Food and Drug Administration (FDA) before introducing a new food additive. "The OCA is focusing its efforts on educating the public about the potential risks of nanofoods and putting pressure on government agencies to increase oversight," says Minowa, adding that ever-tightening federal budgets, at least in the U.S., will make the latter a huge challenge. "There’s a lack of consumer understanding, a lack of government oversight and a lack of labeling," says Minowa. "Combine these with a lack of testing and you have an equation for serious problems." Although there is far less opposition to nanopackaging than there is to nanofoods, there are some who argue that the use of these devices will allow the food industry to further shirk their corporate responsibilities. "While devices capable of detecting food-borne pathogens could be useful in monitoring the food supply, sensors and ‘smart packaging’ will not address the root problems inherent in industrial food production that result in contaminated foods: faster meat (dis)assembly lines, increased mechanization, a shrinking labor force of low-wage workers, fewer inspectors, the lack of corporate and government accountability and the great distances between food producers, processors and consumers," says the ETC Group ("Down on the Farm: The Impact of Nano-scale Technologies on Food and Agriculture"), a conservation and sustainable advancement organization. "Just as it has become the consumer’s responsibility to make sure meat has been cooked long enough to ensure that pathogens have been killed, consumers will soon be expected to act as their own meat inspectors so that industry can continue to trim safety overhead costs and increase profits." Interestingly enough, the Environmental Protection Agency (EPA) in the U.S. declared on November 22, 2006 that it intends to to regulate a large class of consumer items made with silver nanoparticles. The decision, which will affect not only washing machines but other consumer products such as odor-destroying shoe liners, food-storage containers, air fresheners, and a wide range of other products that contain nanosilver, marks a significant reversal in federal policy. Nanosilver containing consumer products that are applied to food packaging are not regulated by the EPA but by the FDA. The FDA is still considering whether it needs new rules for nanomaterials.